Nothing excites me more than the clatter of an idea for a new book. If I’m not writing, I’m thinking about story. Researching, taking notes, talking to friends, muttering to myself. I was born in Philadelphia when my father was in medical school. I’ve lived in Pennsylvania, Hawaii (twice), Alabama, New Jersey, Michigan, Colorado, and now California. I began my writing career the way so many others have done: by first doing everything else. Winning awards in grade school art, story, and essay contests convinced me to become a writer, but the real world intruded in adulthood and demanded I pay bills, raise kids, (loved raising kids), be a contributing member of the community. Along that rutted path I worked in the commercial art field designing patterns for surfer shorts, bikinis, and Hawaiian-style shirts, and taught after-school art through a city recreation program. I developed an art curriculum for three private schools, teaching kids from kindergarten through high school, loving every minute of being in the presence of such extraordinary human beings. I’ve also taught religion courses, including Hebrew as preparation for Bar and Bat Mitzvah. Sixteen years ago the writing muse, struggling to breathe in art articles, letters to friends, and skits for kids, found its way to the surface. In a two-week period I wrote sixty pages of my first historical novel, and didn’t stop writing for three years. By then a second book demanded paper – OK, computer space – then the third showed up, and now a fourth is in final revision stage. Of course, final revision is two words with a long shadow and a little footprint. At the same time, I query agents, hoping for the singularly elusive entree to be read, eventually to be represented. My fiction explores history, human relationships, revenge, identity crises, rage, family dynamics, self-doubt, forgiveness, redemption, and all the labyrinthine quandaries that mess up otherwise perfect lives. I hone the writing craft in anticipation of one day being published. I’m eager to accept writing advice and happy to share what I’ve learned. Some folks claim they will write when the floors get vacuumed, family dinner is prepped, the new garden planted. I reside in a eucalyptus forest in Southern California with my patient husband who’s learned to vacuum but not to cook. And the garden needs help. I am proof that all those tasks can be successfully ignored but not the urge to write. 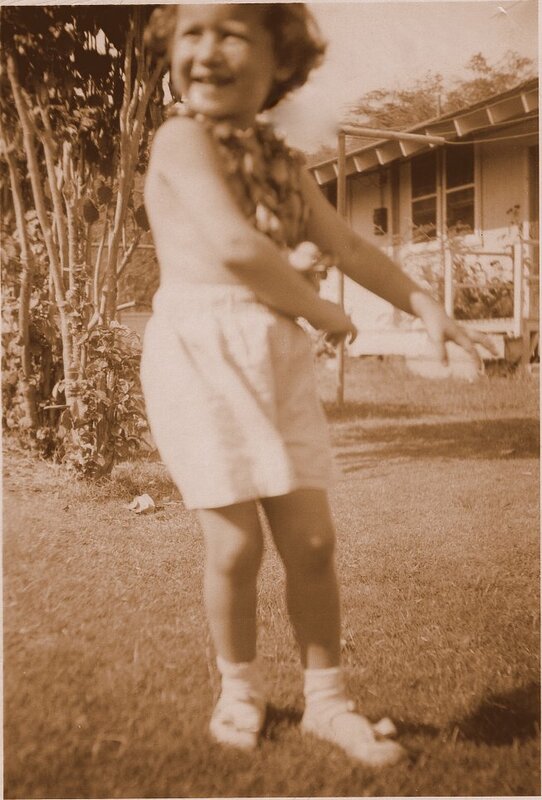 Photo, family files, Shari, age 4. Thank you, Don Charisma, I am truly honored by this. It’s the first time I’ve been nominated for a Liebster. I’ll have to spend a bit of time to answer your questions and will also look into the practical application of the award for my blog. Thank you for visiting my blog. I’ve really enjoyed yours. Hey Shari, my pleasure, and happy to be friends with you. Hey, I’ve awarded you a “The Versatile Blogger Award”, yay ! Another long overdue thank you, Don. Again, more robust acknowledgement to follow. Thank you, Don. I noticed you gave me this humbling award but haven’t been able to acknowledge it properly. No excuses, not wanting to seem ungrateful, I just have a month’s worth of activity to address. A more substantial thanks will follow soon. I’m looking forward to reading your blog as well. Thanks so much for the Follow. Poke away all you want at my site. I’m an open book. If you see anything that makes you smile or laugh or not, I’m pleased. Thank you, Tess. I’ll be back to your site – too much fun and REAL stuff there, don’t want to miss it. I’m deeply touched by this nomination. Will check it out when I return from work this evening. Thank you. Thank you! May you enjoy the season as well – and you probably will, with a wonderful culinary invention that uses the local food. Yep, you will. Wow, Don, I’m overwhelmed by the Inventive Blogger Awards! And deeply appreciative. Thank you for such recognition. It’s going to take me a while to return this in kind and I thank you for your patience. Meanwhile, I love your blog, especially since I feel like I’m visiting Thailand as well! You’re a terrific photographer and your sense of humor and beauty make me smile. Thank you, Don. You have to be the most generous blogger on the web. You are kind to think of me. Thank you, Don. I can’t keep up with the awards you generously grant but my sincerest thanks for them. I’ve just had two of my short stories published in an anthology and wondered if you would review the book on your blog? It’s called ‘The Milk of Female Kindness’ and includes short fiction, poetry, art, memoir and medical writing on the theme of honest motherhood. Some of the writers have recently given birth, others are grandmothers. Some, like me, are childless; my writing is inspired by memories of my own mother. Some of the pieces will make you smile, others are heartbreaking. I’d be very happy to send you an e-book or hard copy, or some sample stories. You know how thrilled I am for your writing success as I noted on your blog. I’m a huge fan of yours and would be honored to review your stories. However, I don’t have an E-reader, so this means I’d have to have a hard copy sent, but I also don’t have a place I can take a private message to set this up. In fact, I just spoke yesterday with a techie friend about how to contact people without exposing personal info to the world. She explained that I need to establish a new email account just for this sort of thing. So, while I’d like to say yes, because I’d love to do this for you, it will have to wait a bit till I get the new email account going. I’m not good at doing this and the person who helps me isn’t available often. I guess this is back on your base – are you willing to wait a bit? If you are able to think of way to get the book to me, I’m game, but I know it’s coming out in March. Probably you need this done soon as possible. I replied to your email. Let me know if you got it and then we can proceed. Yay! You caught my attention when you said you wrote literary fiction! Love that genre. Hope to look around more leisurely later, but what I’ve seen, I like! Kate, I think we’ve joined the Mutual Admiration Society. Your blog is terrific in so many unique ways and I will be back often. Thank you for the follow here. I just noticed how beautiful the badge is! You did a great job! Thank you – I feel very honored to have been nominated for this. I’ve been enjoying your posts. I was wondering if you would be interested in participating in a Blog Tour on the writing process. Long story short, you would answer 4 questions about what you’re writing and your writing process and then pass the torch onto 3 other writers. Let me know. Will send details if you’re interested. Thank you for this honor. I appreciate that you would consider me for this. However, I just agreed to participate in what I suspect is the same blog writing tour after I was asked by Sandra Danby. My post will be published on April 14. Thank you also for letting me know that you’re enjoying reading my blog. I’ve certainly enjoyed yours – you have a great sense of humor and some pretty wonderful friends and family! Thank you, J-Bo. I will still be following your blog and I really treasure your honor. Thank you, Don, but this is another award I will pass on for the same reason that I chose not to accept the Inner Peace Award. Be well, Don. You’ve got a big heart. Don, you are so generous with awarding your fellow bloggers, but I’m going to pass on this one, for a peculiar reason. I cannot figure out how to get the badges or any images onto my blog site, which means I can’t pass on the awards to others. People have tried to assist me but I still can’t do it. Still thank you for the honor. It is much appreciated to be recognized by you. I really love your header picture–let’s hit the beach! Thank you, though I didn’t take the photo. I’m an artist, a painter and art teacher, and one day intend to paint my own art for the blog, but no time yet. Yes, all things beach, all things nature, are so lovely. Glad you enjoy. Thank you, Don Charisma, for this new award. The badge is quite striking and you are as always, generous in acknowledging your community. I guess I can’t actually accept this award, however. I am so technically doofus that I have no idea how to find a video that I like nor would I be able to embed it in my blog. In fact, I have yet to be successful in attaching images to my blog or the other badges I’ve been awarded. Any that show on my site – someone helped me! Still, I treasure your spirit and I value that you would so honor me. Welcome, M.L., to my blog. Charlie is something special, isn’t he? He not only shares so much of himself on his blog, (which I LOVE) he shares the spotlight with many other artists and opens doors for everyone. Thank you for stopping by and I hope to see you again. I’ll be taking a look at your blog as well – interested in meeting you. Best wishes as you tackle your writing project. Me too – delighted to meet you – and always working on a WIP. I don’t have your email address so I’m sending you this via your about page. (We should do something about this oversight.) The following link is definitely NOT to make fun of anyone. I just thought it too cool not to share. Thanks, Glynis, I appreciate that you thought of me regarding the article and forwarded it to me. I found it on Adrienne Morris’ blog and read it yesterday – quite an interesting situation. No problem sending it to me via my About page, and a reminder that I really need to rewrite the thing, and then put it in its own little spot on my blog. I only have one email address and I so wish I’d created another one attached only to my blog. Now I’m stumped – create a new email just for family and friends, and hope I don’t lose anyone in the transition? Or a new one just for the blog, and hope I don’t lose everyone in the transition? It’s like trying to untangle hair clogging the bottom of the sewer. Just so you have it, my email address is glynis.jolly@outlook.com. Most email clients including the web-based ones (which is all I use anymore) have way to filter emails to specific folders before you even open them. I’ve thought about doing this myself but hesitate because I know I’d forget to open some of those folders when I first hit my inbox in the morning. I’ve been categorizing my email so as I go down the list in the inbox I can readily see what kind of message it is–blog notice, twitter, goodreaders, family, friend, et cetera. Thanks for the helpful suggestions, Glynis. And I got that nixing the micromanaging from your post about what a miserable experience you had. So, double thank you. The last paragraph of your about page is the best. I can relate. This blog looks wonderful so far and I look forward to following and reading more! Come with me to the jungle? Glad you liked it and thank you for the follow. Much appreciated. Is your garden that needs help the jungle? Mine is getting there too! LOL. No, we live in Southern California where the drought has left our yard a patch of rocks, leaves that have fallen from the eucalyptus trees, rock hard dirt, and plants dying because we cannot water them sufficiently. We are turning the yard into a drought tolerant specimen but it’s a slo-o-o-ow process. I wish something that wasn’t a dead and dried up leaf would take up more space. Maybe it’s these arid conditions that led me to write about jungles. Actually, these three passages are from favorite books and outstanding authors. I’d be interested to hear how the process of drought toleration goes. I love succulents and actually have the worst time not killing them. I wonder if they could survive well in a situation like yours? It is succulents to which we are slowly adapting. They survive fairly well but the yard is reigned over by the enormous eucalyptus trees that had been planted in the area about 50 -70 years ago. All in straight rows because the myth – legend goes that the planter wanted to grow trees whose wood could be used for railroad tracks. The more I thought about how unlikely this idea was, the more I realized that we’ll probably never really know why millions of eucalyptus were planted here. But, what we do know is that they have been invaded by giant longhorn beetles, a kind of slow moving and ugly roach whose larvae eat the trees inside out, making them rot and very dangerous. The trees fall over without warning. We’ve removed nearly all on our own property but are not allowed to remove those on nearby community property. And the remainders of the trees are: roots in the sewer system requiring constant repair and tree sap that has poisoned the ground, preventing many other species from growing. OK, enough about our trees. Wow. I’m interested in what you just taught me! I live in New England so it’s pretty different. We get plenty of rain and mild temps, although it’s been pretty hot for us lately. The blue gum trees in Southern California are not native. They were imported from Australia. Blue gum are some of the most unattractive of all the eucalyptus species. I actually love trees, but the eucalyptus were planted incorrectly. A healthy forest must have diversity. So if that was what I taught you, I may be a bit prejudiced. I was born in Philadelphia and have lived in New Jersey, Hawaii (twice,) Alabama, California, Michigan, Colorado, and again California. From the Atlantic to the Pacific to the Great Lakes. I’ve lived in so many different climates and have loved many of them. Thick eastern forests with rolling meadows and waterfalls everywhere; mountains rising a mile above valleys and riven by deep gorges with rivers tumbling over rocks; tropics with wild flowers and fruit everywhere and the whole island surrounded by the ocean; arid deserts sculpted millions of years ago by raging winds and roaring seas; wild chaparral covered by poppies, lupine, mustard, and sage. I’ve lived through a tornado (but not in the middle of it and only a mild one) blizzards, tsunamis, earthquakes, the threat of out of control wildfires; torrential rain for days on end; hail and snowstorms; extreme heat and extreme cold; snow so deep that it couldn’t be safely traversed; and floods from rising rivers. I’ve experienced humidity so high that I dripped all day and heat so high that I suffered heat exhaustion, and temperatures below freezing that made it hard to breathe. You have some pretty dangerous winter blizzards in New England, don’t you? Deep winter snow? And high humidity in summer? Threats of flooding rivers in spring? Icicles hanging 3 or 4 feet off roof eaves? Ice freezing the rivers? It’s fun talking with you. We are separated by decades (I am WAY older than you) and by a continent, but I feel very close to you by some of our shared experiences. Nice talking with you, and looking forward to more conversations. Friends call me Shari. Do you mind if I ask your first name? My name is Angie. 😊 Nice to meet you. So glad you found blogging, as am enjoying your site! Good luck with your wonderful writing. Thank you, Daal. I really appreciate your comment and will be popping over to your blog soon. It’s a pleasure to meet you as well. You’ll note that I’ve been around your blog a bit and will definitely return often. Your story inspires me a lot ! I too wish to one day become a writer, but I have so far done everything BUT write. Great testimony, so happy I found your page. Please stop by my blog if you have the chance. My latest post was on my own personal reflections and I would love your feedback. Naomi, thank you for stopping by. I will take a look at your blog later this afternoon. One tiny piece of early advice: you do have to write if you want to be a writer. But you can start with very short works as you build your writer’s skills. I’m truly humbled by your comment. Thank you, Bea. I’m glad to meet you here. For some reason I can’t find the comments box on your posts, Sharon – and I’d like to leave one! Is it just me – the wordpress version of fridge blindness? Anyway I wanted to say that I admire your drive in trying to get published – it’s a road that’s defeated me, since I’m not very persistent, or maybe even motivated (except in a dreamy sort of way) so I wish I had your determination. Thank you, that’s a very encouraging thing to say about me trying to get published. Not sure what to tell you about the comments box. As far as I know, people are able to find it at the bottom of each post because there are always comments. But it’s certainly possible that other readers also can’t find a way to comment. I’m not sufficiently technically proficient to help you. I hope you’re well, Sharon. I’m inviting a few of my favorite blogging friends to be featured in a series I’d like to do about family history in August. I’ll contact you shortly, Adrienne. I removed your private contact info from the site. I did notice the new one and sent you an email this morning – did you get it? I can send again. The answer basically is yes, of course, I’d be honored. Your story is interesting – and that hula picture the sweetest!!!! Thank you. If you’re interested, this is the link to more of the story behind that photo. I found you through other blogs and decided to visit. I haven’t read any posts yet, but after reading your “About” I can tell your writing talent will take you places. I wish you all the best in your publishing journey, too. Lauren, thank you for visiting and for your enthusiastic support of my writing. I’m nearly ready to start the querying process for one of my books – we’ll see what happens. I wish you all the best, Sharon. It’s not an easy road, for sure, but trying is also better than giving up without a shot and wondering what could have been…:) I’m sure you’ll keep us posted! That’s exactly how I feel. Thanks for understanding. I may be getting closer to putting on the shoe. Thank you for your comment – nice to meet you, M. Lewis.